Cost: Average cost per trip is $80.00-$120.00. All companies have varied rates and cost is dependent upon number of trips and wait time. Some companies have minimums and other rates are all-inclusive. Once you have collected your luggage, please exit Door 511 for East Terminal or Door 506 for West Terminal and proceed to the Limo Booth at Island 1. Indicate you have a pre-arranged car, which limo company the car is booked with, and your last name. The official will contact the holding lot for you and dispatch your car. Denver International Airport (DEN) is a major airline hub, the sixth-busiest airport in the United States and 19th-busiest in the world, serving the third most destinations of U.S. airports. Getting from DEN to downtown Denver has never been easier. Ride the airport train for only $10.50 each way. Learn more! Shuttle company prices are approximately $20 one way/$40 round trip. Please contact each company directly to confirm their rates. Check out our list of taxi companies, phone numbers and flat rates from Denver International Airport. Check out our list of limo companies that serve the Denver area, including Denver International Airport. All Rental Companies are located in Denver International Airport. 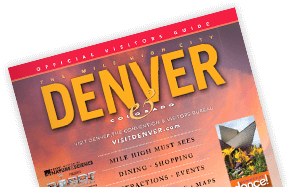 A variety of motorcoach charters serve the Denver metro area. Check out our listings. Public bus service is available to and from Denver International Airport. Check out the schedules.